Americans in New York, Ohio, Michigan and Pennsylvania reported seeing a fiery, 500-pound meteor soar through the sky this week before the space rock apparently broke up somewhere over the Keystone State, according to scientists. NASA said on Tuesday this week that the meteor entered the Earth’s atmosphere in the sky above western Pennsylvania earlier that morning and was reportedly witnessed by spectators stretching for hundreds of miles across the United States from the Mid-Atlantic to the Midwest. 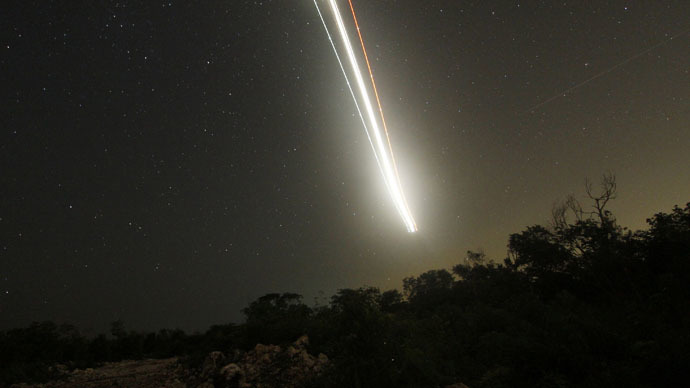 Three cameras maintained by the American space agency captured the meteor making its way over the US, including one at the Allegheny Observatory near Pittsburgh, PA that NASA says shows the space rock traveling roughly 60 miles above the Earth at a speed of 45,000 miles per hour. “It flared brighter than the full moon before the cameras lost track of it at an altitude of 13 miles above the town of Kittanning” near Pittsburgh, NASA said in a statement on Tuesday. The fiery trail was visible all the way on Earth because, according to non-profit scientific organization, American Meteorological Society, air molecules excite a column of atmospheric atoms along the rock’s path as it enters the atmosphere. According to NASA, fragments of the burnt out meteor (known as “meteorites”) likely ended up on the Pennsylvania ground miles below the rock’s pathway. “This celestial visitor had an orbit that took it out to the main asteroid belt between Mars and Jupiter - it came a mightly [sic] long way to a fiery end in the predawn Pennsylvania sky,” NASA said on the aerospace group’s official Facebook page. In all, the AMS received nearly 100 reports from eyewitnesses who said they saw a fireball in the vicinity of southwestern Pennsylvania earlier Tuesday.